View the latest CinemaTech products with example pricing here. 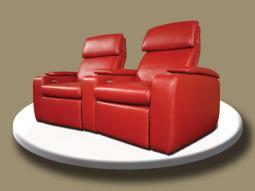 Based in Dallas, Texas, CinemaTech, Inc. has been recognized as a leader in Home Cinema seating since its inception in 1998. 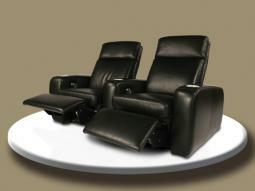 The original provider of the truly luxurious Home Cinema seat, CinemaTech maintains this position by providing customers products of unsurpassed quality, luxurious comfort, and cutting-edge style. All CinemaTech seats are handcrafted in Germany to exacting ISO-9001 standards, and built with the patented Lusch lifting and supporting mechanism. These use one of the most robust mechanisms around, and are seats that will last for years, even with the heaviest of use. Its innovative designs also include such exclusive features as all-steel frame construction, the finest European leathers, fully motorized recline, and a unique articulating headrest. 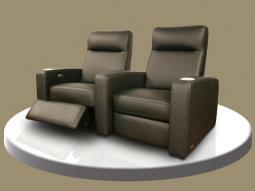 And for those tight spaces, CinemaTech offers several motorized incliner seating models. Click on CinemaTech’s luxury Seating for more details, and come and experience the luxury of the CinemaTech Le Grande recliners at our showroom. However, we’re about more than just seats. HiFiCinema in partnership with CinemaTech, also offers full Home Cinema designs completely customizable to each home owner’s tastes and to the room’s physical constraints. 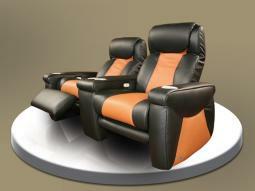 Click on conceptual Cinema Designs for more info. The addition to CinemaTech’s Acoustic Room Systems (ARS) has further expanded our reach into the installation of complete acoustically superior yet aesthetically pleasing Home Cinema environments. ARS provides a corrected acoustic environment that will also help to eliminate distracting noises and allow the articulation and intelligibility of the movie sound track to be clean, crisp, and balanced. This is achieved while maintaining complete aesthetic appeal and beauty of the Custom Home Cinema. Click on Acoustic Room Systems for more info. We offer perfect solutions for both Home Cinema enthusiasts and discerning audiophiles with uncompromising standards.